3,400 even year points! Points can be used anywhere in the HGVC network! Buyer may receive a title fee credit, inquire for details! *Hilton Grand Vacations Club on the Boulevard* is centrally located in the heart of all the action! 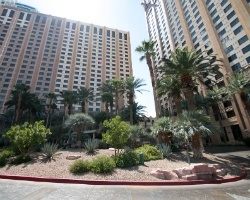 Enjoy world-class casinos less than one block away. Within walking distance of the resort are show-stopping entertainment and five star dining. Las Vegas offers family attractions including the MGM Grand Theme Park and Grand Slam Canyon. Hoover Dam and Lake Mead offer superb sightseeing, only 45 minutes away. To discover more about this resort, visit www.hiltongrandvacations.com. *RCI Gold Crown Resort* Featuring a finely appointed 1 bedroom, 1 bath suite that will accommodate 4 guests comfortably. Biennial even usage is based on points, with 3,400 points every other year included in the sale. Points can be exchanged at this outstanding retreat or any resort in the HGVC network. Maintenance fees paid annually. For more information or to make an offer, please submit the inquiry form.